For example, one doctor billed $4,500 for an office visit when Medicare would have paid just $134. Another doctor billed $14,400 for removal of a gallbladder when Medicare would have paid $656. And a hip replacement cost $40,000 when Medicare would have paid $1,558. …. [Jeffrey] Rice said people should know they have a choice even when their insurance company is paying the bill. “Everyone knows you don’t buy a car without knowing what the Blue Book value is. Well the same should be true in health care,” he said. “Blue Book,” of course, is a little harder to figure out for triple bypass surgery than it is for a 2003 Honda Civic. In any case, this practice demonstrates both the pros and cons of going to the mattresses over inclusion of a public option in a healthcare reform bill. On the one hand, the really important thing is to get the uninsured insured. With anyone. 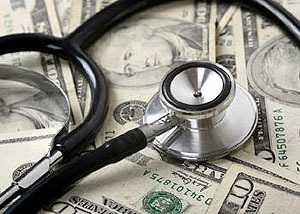 They’ll get better care and their bill will be way lower, regardless of whether they have a public or private insurer. On the other hand, private insurance is expensive, and in most of the plans on offer middle income families (above a cutoff of about $50,000) won’t get any government subsidies to purchase it. A public plan would (a) almost certainly be cheaper and (b) put price pressure on private plans to be cheaper too. Result: more people are insured and fewer people are paying outrageous bills for common procedures.